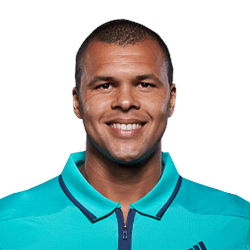 Jo-Wilfried Tsonga, competing in his first ATP tournament on clay since 2017’s Ronald Garros, has beaten 3rd seeded and last year’s finalist Kyle Edmund 7-6 6-3 in an hour and 20 minutes for his 13th win of the season so far. 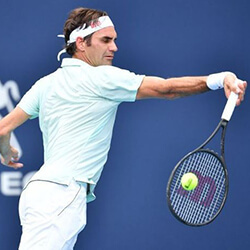 After fully recovering from a knee injury that has seen him off the court for over 7 months last year, Jo put up an impressive performance, only dropping 14 points in total in 10 service games, and face one break point to keep the service games intact. 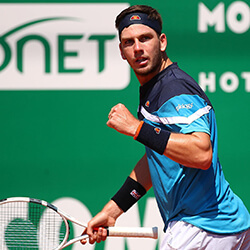 The pressure in the latest at the ATP Marrakech was almost solely on Kyle, and he buckled quickly as he fell behind in a tight opener, suffering two breaks in the second set as Jo battled to the finish line. The French player managed to fend off a break point at 2-2 for the first set thanks to his well-planned attack. Tsonga wasted two of the first two set points at 6-4, with the second one a double fault, before he courted the third at 7-6 after a forehand from Edmund that seemingly took all of his momentum. 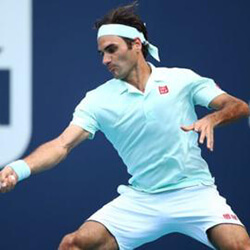 Joe lost only three points on the serve for the second set, and broke through Edmunds defences during the fifth game, taking full control of the court and securing a win with another break in game nine. It’s his most notable win on clay since 2017 in Lyon, where he won the title. 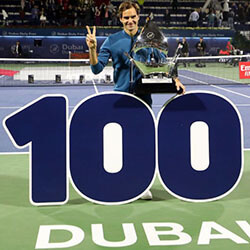 Roger Federer has won his 100th ATP Tour title while playing at the Dubai Tennis Championships, a total of 6600 days after winning his first in Milan. The 37 year ….